Uniforms distingish authority, occupation and unity. 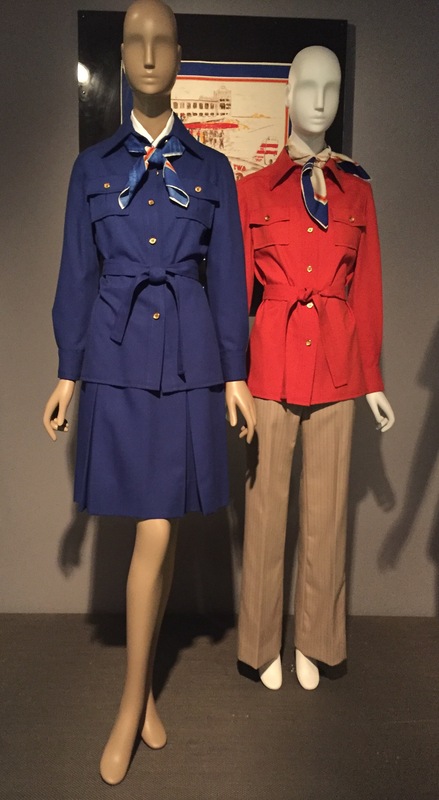 The exhibition shows how uniforms have influenced fashion and in turn how civilians have worn uniforms. People adopt their own uniforms as well. These pieces of clothing give comfort, confidence or a feeling of purpose. Be it jeans and a t-shirt, suit and tie or dress and stilettos. They become outfits you put on without much thought because they have become a type of uniform. 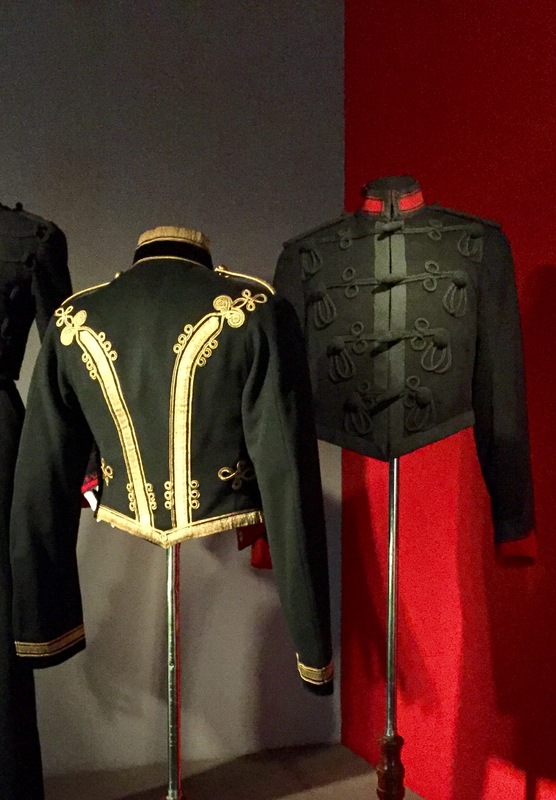 The exhibition shows both a historically accurate uniform and the fashion that has been influenced by them. We often do not notice how many times we see uniforms. Students, sanitation and fast food workers wear uniforms every day.While functionality is the purpose of a uniform designers have made the useful fashionable by changing the length of a school skirt, exaggerating the size of a military button or embellishing a footbal jersey. Military Men’s Royal Artillery and Royal Rifle Corps “mess dress” jacket. England 1990. The heavy threads originally were for protection against blades in battle. Royal Highlanders uniform. 1905 Scotland. U.S. Army uniform 1940. As you can see the color scheme of uniforms changed drastically. It’s original purpose was for easy recognition between enemy and fellow solider. The move into guerrilla warfare introduced the need to blend in with the environment which the olive color achieved. Left: Yves Saint Laurent 1967. Inspired by the naval “peacoat”. Right: Perry Ellis 1983. Ellis served in the Military Coast Gaurd in the 1960’s which influenced his designs. U.S. Army “mess dress” jacket 1981. The cut and sillouette are similar to British but less elaborate. Strips indicating wearers rank. 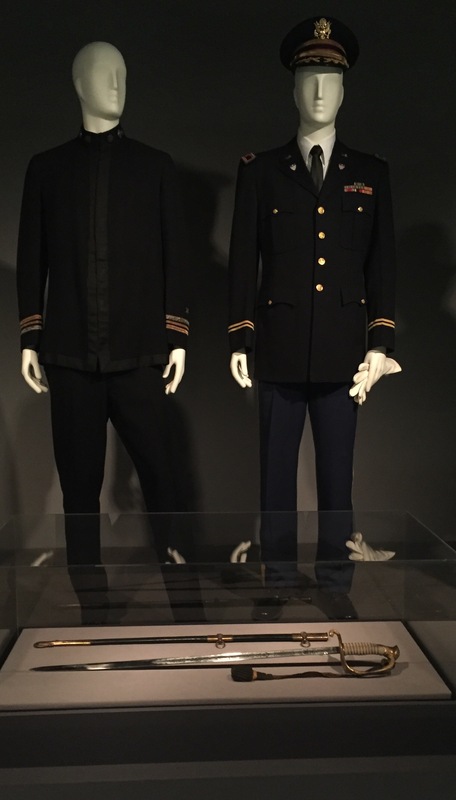 Left: Lieutenant commander’s U.S. Navy dress uniform 1917-1920. Right:Colonel’s U.S. Army “dress blue” uniform circa 1950. A deep blue became known as ” Navy blue” after the British Navy used it in the 18th century and the U.S. Navy in 1802. During the 20th century the olive color became used soley for combat and blue soley for dress. This is were the term “dress blues” originated from. Left: Mainbocher WWII U.S. Navy W.A.V.E.S. Uniform 1942. Mainbocher designed the uniform for the Navy’s Women Accepted for Volunteer Emergency service. It was made from the same wool as the men’s uniform. It was known as both fashionable and functional by the women. Right: Chanel circa 1960. Military details influenced her work since the start of her career in the 1920’s. Left: Man’s WWII U.S “. Army Mackinaw jacket circa 1942. Right: Man’s WWII U.S Army uniform 1914-1918. The Makinaw jacket or “Jeep coat was designed for cooler weather. It was made of cotton for breath ability and cost effectiveness. Right: Kahki colored uniforms were introduced during the Spanish-Ameican war of 1898 and helped with. camouflaging. By WWI brownish-green were the norm. The color was not liked by soldiers and by the 1950 the green -grey color was used. Left: Haas Beothers ensemble circa 1895. In the 1890’s sailor dresses became popular in women’s summer attire. It was worn for the beach or playing tennis. Right: Norman Norell 1957. Norell exaggerated the details of the uniform by enlarging the necktie, making a bow and adding a more feminine touches by using silk faille for material. From left to right: U.S. 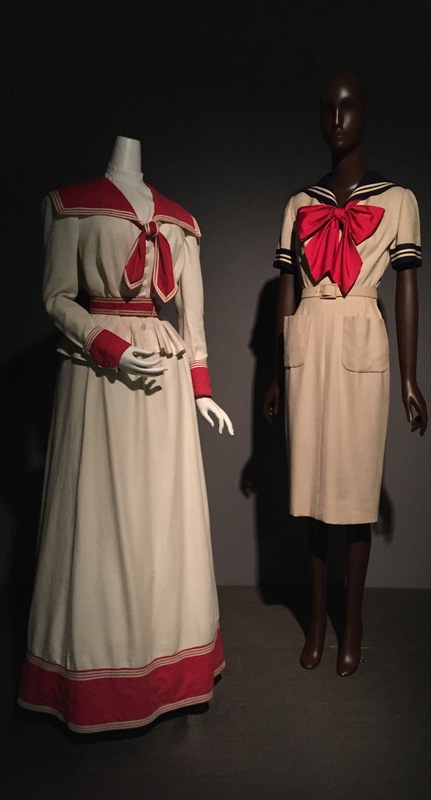 Sailor uniform 1912,Sailor cap 1920’s. U.S. Sailor uniform 1915 ,Navy “gob” hat 1950’s. 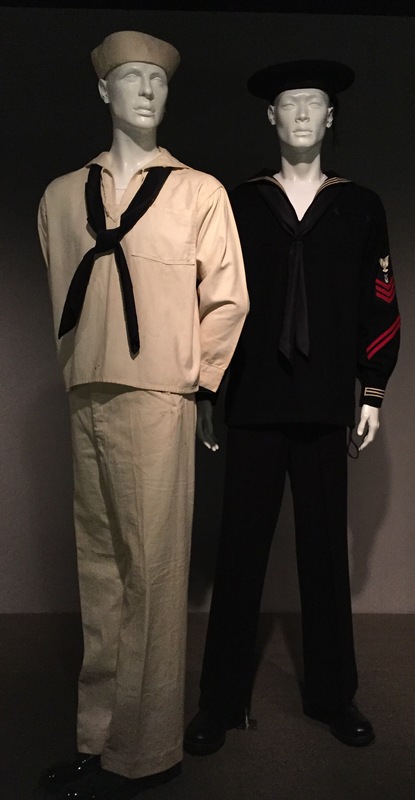 Features like the wide legged flared pants, flap collars and silk ties were details that distinguished the sailor uniforms. White cotton was used for warm weather and deep blue for cold. Oscar de la Renta. Evening ensemble 1984. The sequined chiffon and organza combined the navy uniform with 1980’s high fashion. Left: Jean Paul Gaultier 1993 top and 1991 pants. 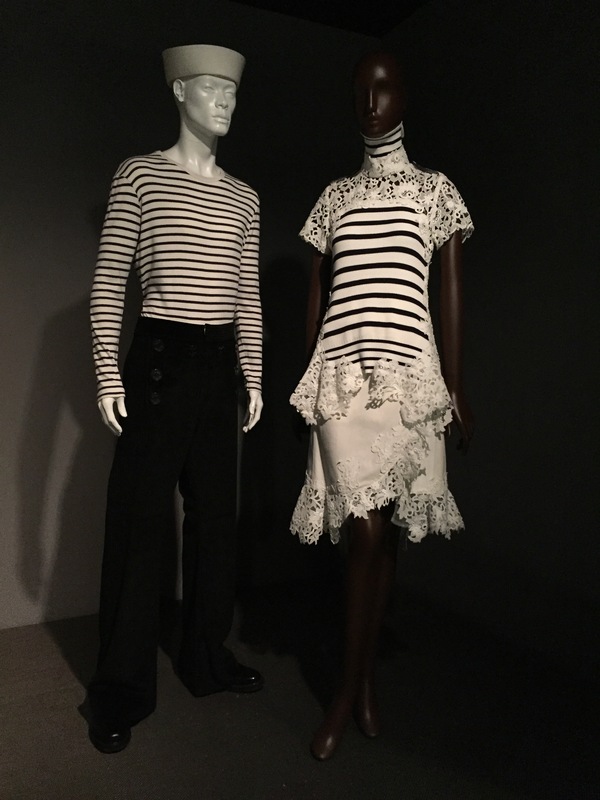 Inspired by the mariniere (horizontal strips) Gaultier made it a staple in his work. Using it in clothing accessories and fragrance marketing. Right: Sacai by Chitose Abe ensemble, spring 2015. The feminine lace challenges the masculine strips. The aviation armed forces developed an all in one uniform known as jumpsuits or flight suits. Paratroopers would jump out of planes wearing them while pilots flew in them. The all in one construction allowed a aerodynamic quality and made them safer then other uniforms that could get caught in machinery. Advanced technology allowed the use of fire resistant fabric. 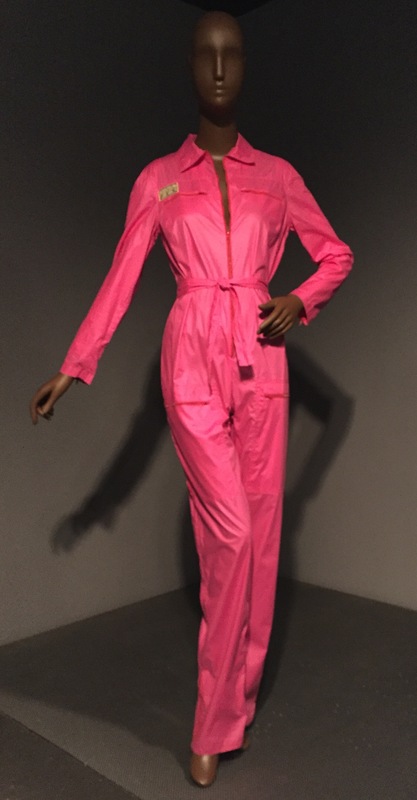 Fiorucci jumpsuit circa 1976. The boxy fit and patch draw inspiration from a mechanic’s uniform. The hot pink, cinched waist and dropped front zipper challenges a masculine uniform with feminity. Right: Richard James Men’s suit 2002. He combines tailoring techniques through the suit and unconventional prints with the camouflage origanally used by the British army in 1963- 2009. Middle: Michael Kors Fall 2013. 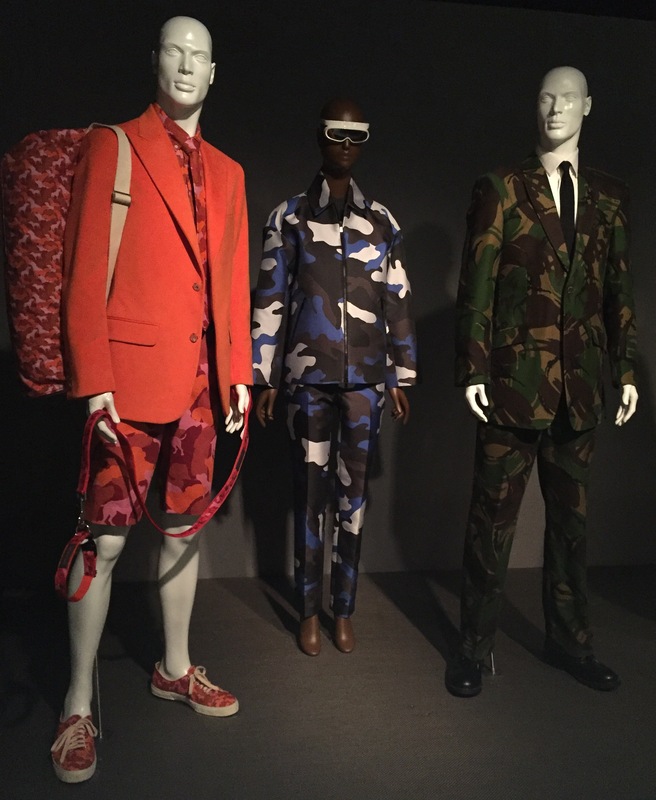 The print was a theme in the collection and the bold colors highlight how fashion uses camouflage to stand out not blend in. Left: John Bartlett , Mari’s ensemble spring 2011. Bartley made camouflage print theatrical with bright colors. The print is of his 3 legged dog. The whimsical print challenges the prints masculinity. During WWII the French developed camoflouge. By WWII the U.S. used it in standard uniforms. Today all combat uniforms are camouflage. Colors and prints differ in countries and climants. Left: Men’s U.S. Marines Corps Poncho and helmet cover circa 1948. Right: Vera Maxwell speed suit dress 1976. Made of stretch fiber and no buttons or zippers. 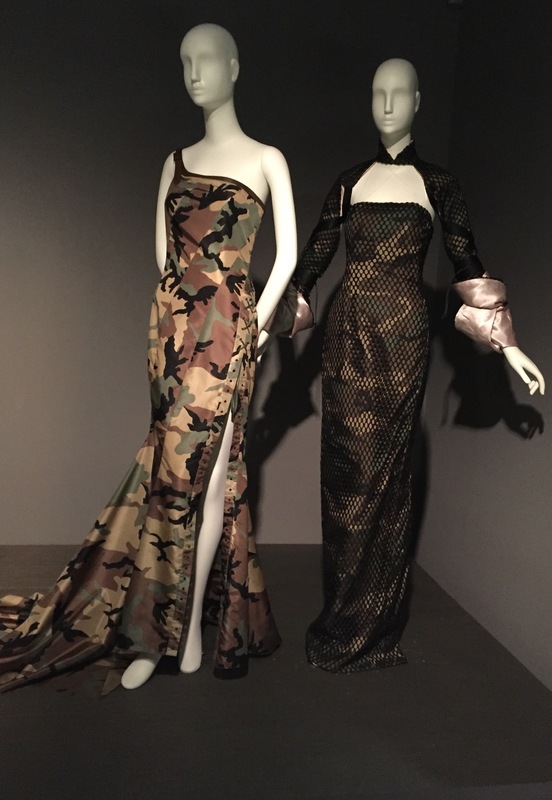 Left: Dior by John Galliano evening dress 2001. The dramatic slit and deconstructed quality combines military and feminity. 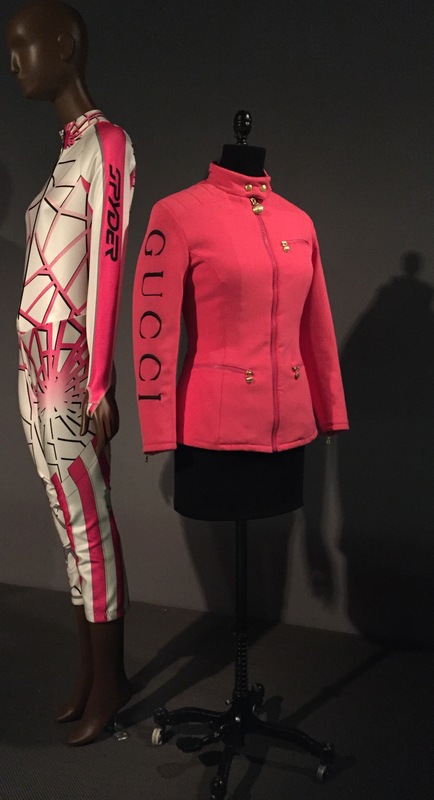 Right: Claude Sabbah evening ensemble 2000. The net and pink satin and rose sleeves combines masculine and feminity as well as street and military culture. Right: Richard James Men’s suit 2002. He combines tailoring techniques through the suit and unconventional prints with the camouflage origanally used by the British army in 1963- 2009. Middle: Michael Kors Fall 2013. Left: Richard James combined tailoring with an unconventional print. Left: Claire Mcdardell ensemble 1947-1950. Influenced by the WWII “IKE Jacket”. 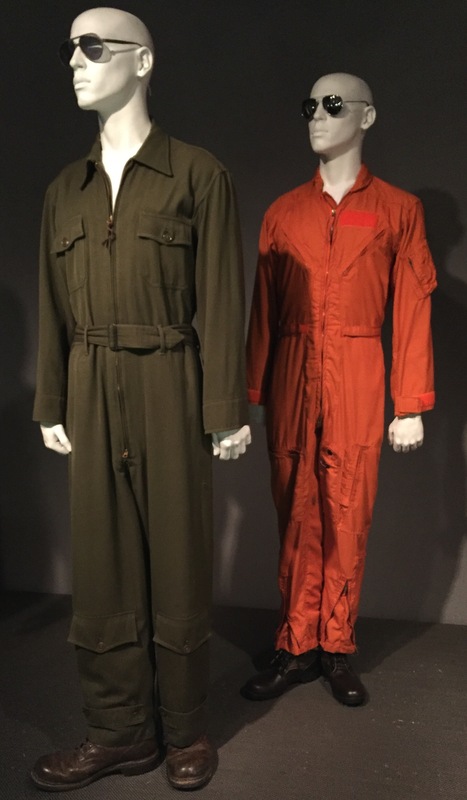 Right: Mans WWII U.S Army Air Corps uniform 1945. WWII W.A.C.S uniform 1943. 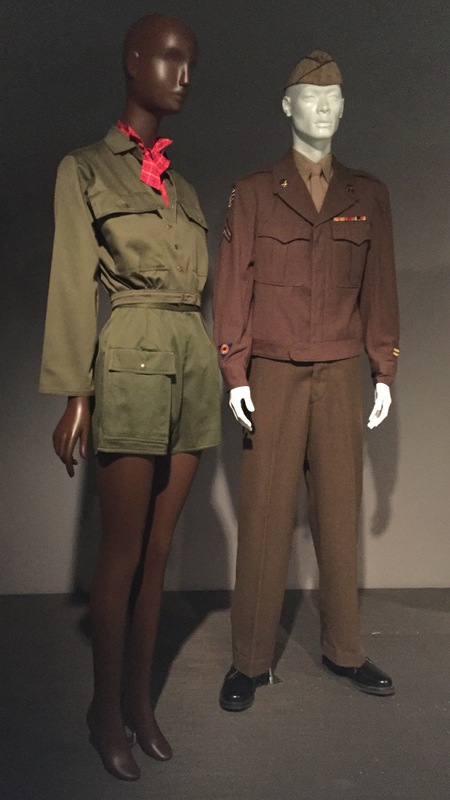 This “Women’s Army Corps” uniform was worn during WWII. The tailoring and draping gave it a feminine touch. The W.A.C.S uniform was considered less fashionable than the W.A.V.E.S uniform and blamed for poor recruiting. 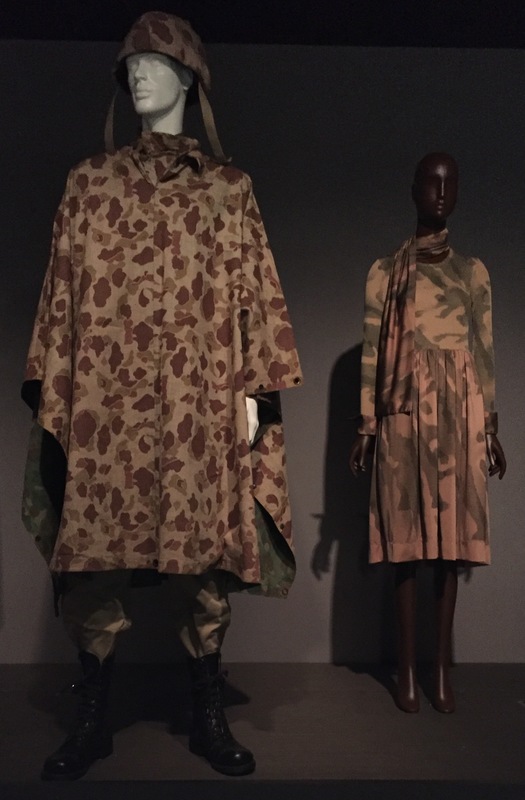 Left: Comme des Garçons ( Rei Kawakubo) ensemble 1998. The designer used the olive green color and replicated the uniform without sleeves. Frayed edges give the look a feminine touch. Right: Marc Jacobs ensemble 2010. The designer copied a U.S. Army Service Jacket. Adding a long skirt added romantic touches to an army influence. Left: Paragon uniform 1950’s. Right Chauffers uniform 1930’s. Domestic servant uniforms striped the wearer of authority usually with the use of light blue colors for maids and plain black for Chauffers uniforms. H. D. Lee Mercantile Co. “Union-All” jumpsuit circa 1970. Usually worn over day clothes the jumpsuit combines work paints and a jacket. In 1913 it was worn by factory workers, mechanics and farmers. Left: New York Police Department uniform 1940. Modeled after the London Metro Police. It also drew inspiration from military uniforms. Right: Knox, New York Pennsylvania Railroad trainman uniform hat 1943. Inspired by the military “kepi hat”. Nurses uniforms had distinctive cap, white collars and smocks. Developed in the mid 19th century for new nursing schools it blends a maids uniform with a fashionable silhouette. Long coats are given to employees of couture atelier’s to protect fabrics and clothing while working. Similar coats are used by lab technicians and doctors, the starkwhite emphasizing clean conditions. In the 1960’s airlines had designers make flight crew uniforms. 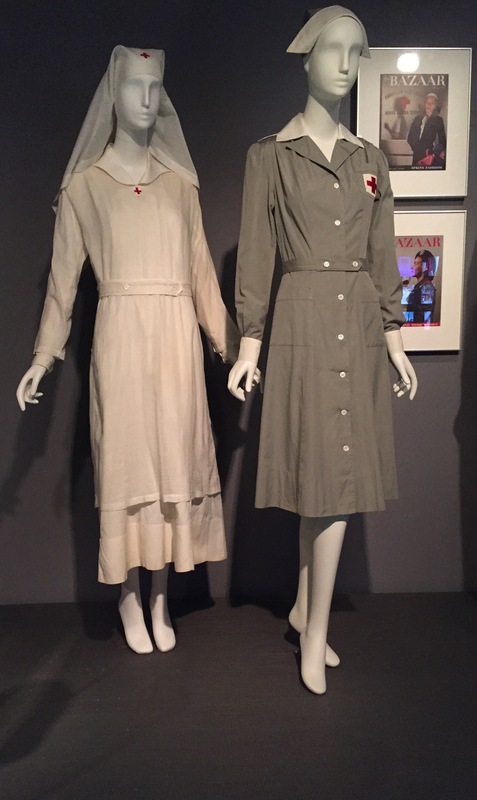 Stan Herman combined the nurse and maids shirts dress with a safari suit to create the uniforms. Stan Herman 1975 TWA flight attendant uniforms and scarf. With originally no company uniform McDonald’s hired Stan Herman in 1975 to create them. 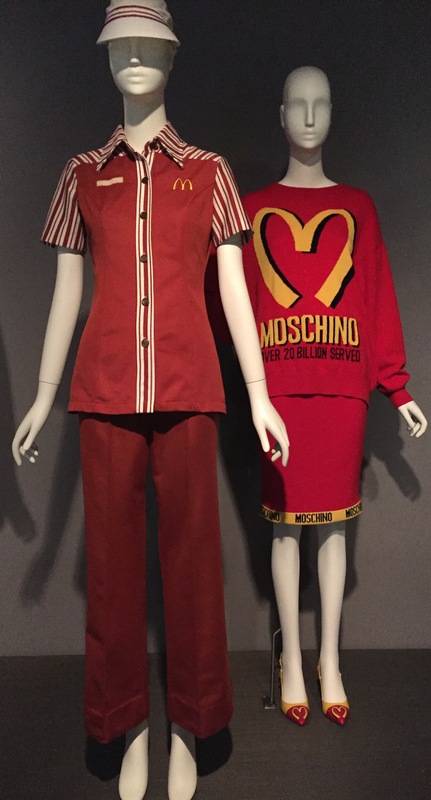 Right: Jeremy Scott influenced by the McDonald’s uniform used the Moschino “M” in his Fall 2016 collection. Karl Lagarfeld for Chanel. Fall 2015 ensemble. Influenced by the Parisian waiters uniform. School uniforms were introduced by Eton College in 19th centry England.The Eton suit for younger students known as the “bum freezer” had a short jacket and no tails. While the older students wore tailcoats and top hats. 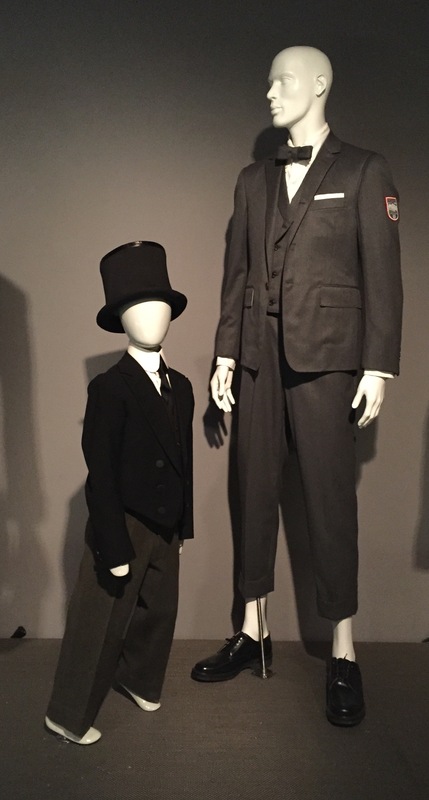 Left: Eton Suit 1930, Right: Thom Browne 2006. Inspired by the “bum freezer” the suit was includes a vest and short jacket fusing the looks of adolescent and adult into one. 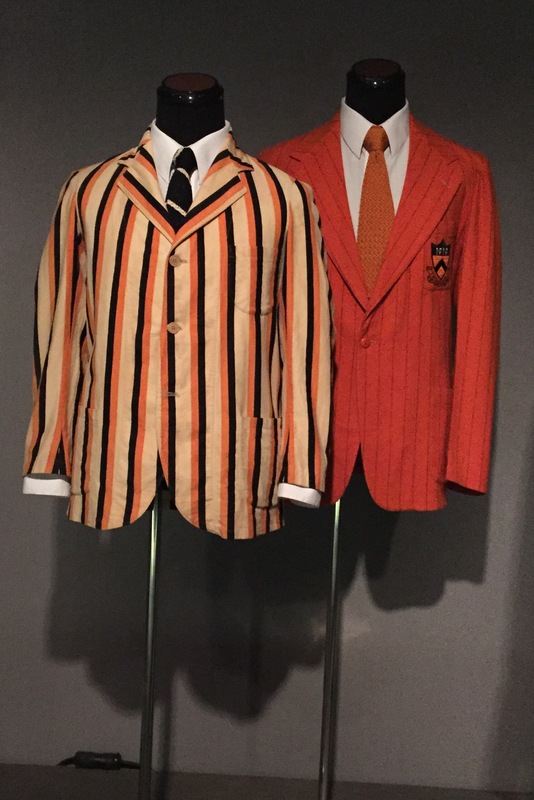 Left: Men’s collegiate blazer 1928. Right: Brooks uniform Co. Men’s Princton blazer 1944. The term “blazer” comes from the red jackets worn by the rowing team at St. John’s College. The blazer entered “Ivy League” style dressing in the 20th centry. Bright colors and patches identify school and class. In the 19th centry Japan began using western style uniforms in schools. Muratado Company boys and girls uniform 2010. 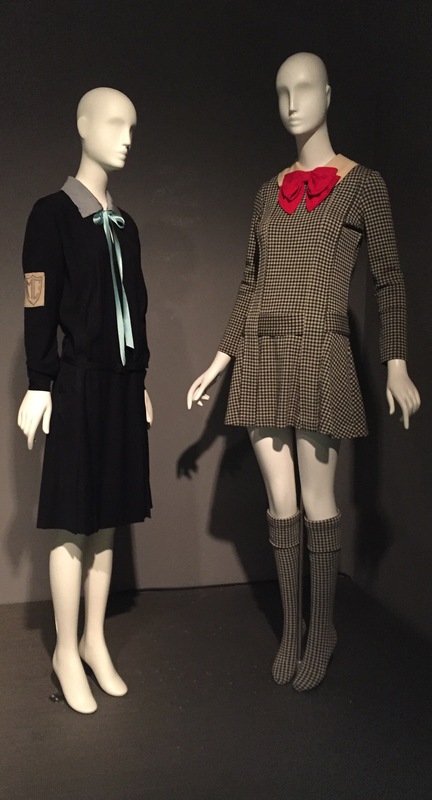 Left: McCarthy and Simon school uniform circa 1927. It tied in men’s tailoring with inspiration from sailors uniforms. Right: Rudy Gernreich Fall 1967. Inspired by the sailor look school uniform. He added the ” mini skirt” beginning the fetish school uniform trend. Caps: Yankees baseball cap 1979. Vivienne Westwood circa 1993. The cap developed in the late 19th century was used to block the sun. Embellishment with colors, mascots and colors distinguished between teams. The 19th century baseball uniform included a shirt “jersey” with the team name. Decorative cursive began in the 1930’s. Replicas became fan gear and another form of revenue. Left: Raleigh Men’s cycling uniform 1985. Middle: men’s cycling shirt 1971-72 Switzerland. Right: Emanuel Ungaro sweater circa 1969. Inspired by cycling uniforms the U is the designers signature. The logo technique used in uniforms helped start branding. Competitive cycling suits orginally made of wool jersey to absorb sweat and tight for aerodynamics. The bold colors allow watchers distinguish athletes. Left: Geoffrey Beene evening dress Fall 1967. Inspired by the football jersey covered in sequins. 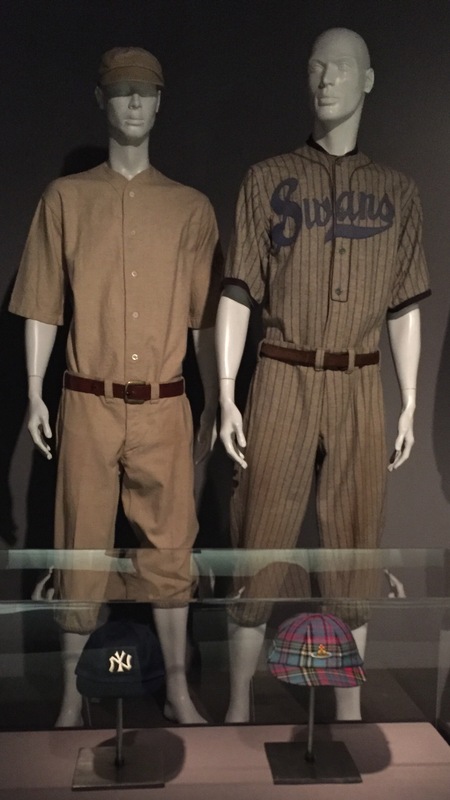 Right: Footbal uniform pants circa 1915 and sweater 1920. Original football uniforms had no padding and used colors and numbers to distinguish players and teams. Stella Jean ensemble spring 2015. The designer combines feminity and boyish styles with different cultures and colors. Tom Ford for Gucci jacket 1995. Inspired by a ski suit. Ski ensembles are insulated for cold weather and made of stretchy synth ethics for aerodynamics. Bright colors and text distinguish teams and sponsors. 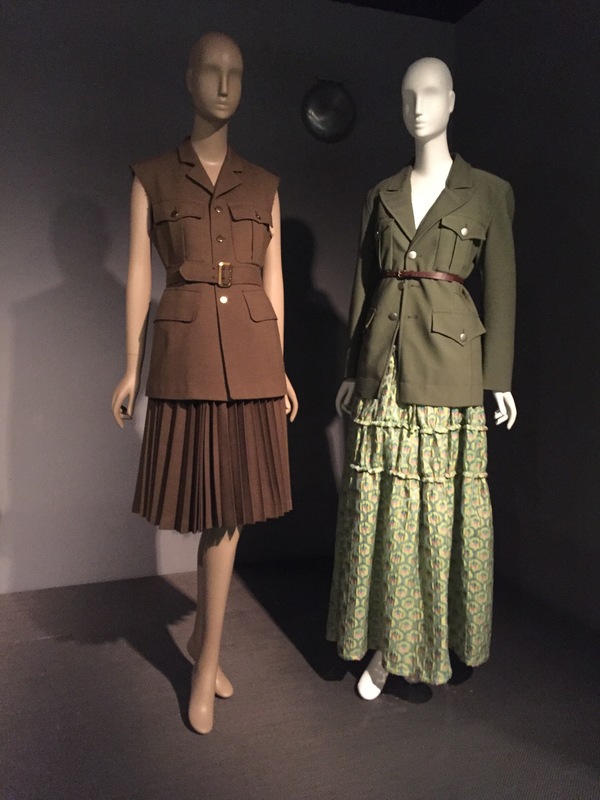 The exhibition shows how sports, military, school and work uniforms have influenced fashion. 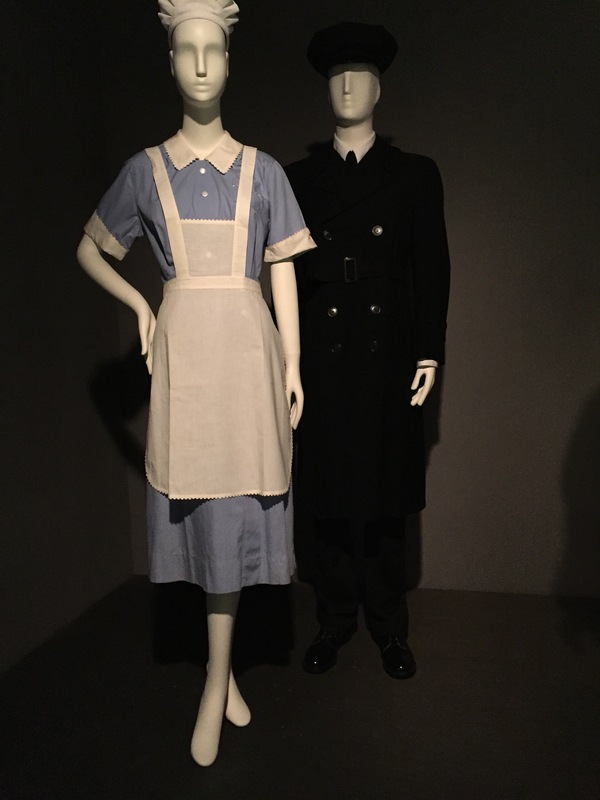 But it also shows how fashion has changed the way uniforms were designed and made. Fashion not only changed what uniforms look like but what they are made of as well. As much as fundability is an important part of a uniform fashion is equally important. It influences how people feel in the uniform, how the wearer is perceived and the message it sends. The uniform is not only a symbol of authority it is also a fashion statement. Uniformity is open May 20- November 19th 2016. 7th ave at 27th st. NY,NY.